Home > Hinduism > Hindu Festivals > Diwali > Why does a sister perform aukshan to brother on Yamadwitiya? Why does a sister perform aukshan to brother on Yamadwitiya? 3.1 Why is Kartika Shukla Dwitiya called as Yamadwitiya and Bhaiduj? This is the day of beginning of calculation of time as per Vikram Samvat. In the first century BC, Shakas attacked Bharat. The King of present Ujjain, King Vikramaditya, trained the youth of Malwa in martial arts. He attacked Shakas and drove them out of the country and established a kingdom based on religion. As a symbol of the victory, Emperor Vikramaditya started count of time named Vikram Samvat. This is prevalent since 57 B.C. This shows how ancient is the concept of time calculation in the Bharatiya culture. Kartik Shukla Pratipada is the half day of the three and half auspicious days falling within an year. This is one of its importance. Balipratipada is celebrated on Kartik Shukla Pratipada. As per Hindu Scriptures, on this day Bhagawan Shri Vishnu sent the King of demons, Bali, to Hell and curbed the loss to the Universe due to his misplaced philanthropy. Due to the excessive philanthropy of King Bali, wealth was acquired by ineligible people. This adversely affected the world. Then, Shri Vishnu incarnated as Vamana and requested land enough to place His three feet. Then Vamanadeva assumed expansive form and covered entire Earth and outer space in two feet. King Bali offered Him his own head to place His third foot. Before sending King Bali to Hell, Vamanadeva graced him with a boon. King Bali asked for three days of his kingdom on Earth. These three days are – Kartik Krushna Chaturdashi, Dipavali Amavasya and Pratipada. Kingdom of Bali: As per the religious Scriptures, in the kingdom of Bali, people should enjoy as per their wish barring the actions forbidden by the Scriptures. The actions forbidden by the Scripures are consuming non-vegetarian food, alcoholic drinks and company of inappropriate women. However, today we see an excess of this. On these days people burst firecrackers in excess and cause loss too national property. Some people engage in gambling. Most people keep up till late in the night eating, watching movies, plays etc. Method of celebrating Balipratipada: On Balipratipada, married women do arati of their husband after abhyangsnan. In the afternoon meal various dishes are made. Some people worship the image of King Bali along with his wife, Vindhyavali. The objective of this worship is that King Bali should not cause distress to people on Earth with his power and so that he pacifies the other negative energies. Meaning: O, Govardhana, Who supports Earth! You are the protector of Gokul. Bhagawan Srikrushna had lifted You on His arms. Bestow crores of cows on me. 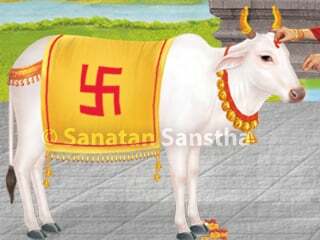 Meaning: O cow, who is Lakshmi Herself in the form of a cow and who bestows ghee for yadnyas, obliterate my sins. In some places picture of Govardhana along with Bhagawan Srikrushna, Gopal, Indra and cow with calf is drawn and worshipped. Kuta means mountain. In this festival a mountain of dishes is made to offer to Bhagawan Srikrushna. Hence, this festival is known as ‘Annakuta‘. As per Bhagawat, on Kartika Shukla Pratipada besides the regular dishes offered as Holy sacrament (Naivedya), a variety of dishes should also be made and offered. As per one’s capacity the dishes should also be given away. In ancient times the residents of Vraj would offer 56 delicacies and 36 dishes to Indra in His worship. In its remembrance after Govardhanapujan the Annakuta festival is celebrated. ‘Margapali’ means the festoon hanged on the road. In the Dharmasindhu and Adityapuran it is advised to make a long and strong rope of Darbha (sacred grass) and fasten leaves of the Ashoka tree and make festoons. These should then be tied at the entry point of the village on high pillars. They should be worshipped with sndalwood paste, flower etc. Meaning: O festoon on the road, bestowing happiness to all living beings, I pay obeisance to you. Do come again for my vowed religious observance (vrat). Pray in this manner to the ‘Margapali’. Then the main man of that place followed by the men and women of the place should enter the village joyously giving victory slogans. Then the main man should get the aukshan done through the married ladies. By walking under the ‘Margapali’ happiness and serenity prevails in the coming year, the diseases are dispelled and along with the residents, the animals also remain heathy and joyous. As per Hindu Dharmashastra, Kartika Shukla Dwitiya is one of the three days of worshipping Yama to prevent untimely death. It is popularly known as Yamadwitiya and Bhaiduj. As given in Hindu Scriptures, on Kartika Shukla Dwitiya due to the presence of frequencies of Yama in the environment, one can face various distresses like untimely death, accident, sudden attack of mental illness due to amnesia, fit like attacks or many obstacles in the task in hand. To restrict the Yama frequencies, worship of Yama and related Deities is performed. On Kartika Shukla Dwitiya Yama leaves His home and enters His sister’s home, that is Earth. Hence, it is known as Yamadwitiya. As a symbol of Yama visiting His sister, every man does not consume meals prepared at home, i.e. by his wife, but goes to the house of his sister to have the meal. Gift from brother to sister. 3 betel nuts are placed on the 3 mounds of rice kept on the short wooden seat. For the worship of Yama and related Deities, the brother sips and releases water from the palm (Achaman), followed by utterance of place and time and resolve. For the worship of Yama and related Deities, from his right side, on the first betel nut Deity Yama, on the second Chitragupta and on the third Yamaduta are invoked by offering unbroken rice. They are offered seat (asan), padhya, arghya etc. They are offered string of beaded cotton and sacred thread (yadnyopavit). They are worshipped with sandalwood paste, turmeric, vermilion, unbroken rice and flower etc. Then incense, lamp and Holy sacrament (naivedya) are offered. After the brother, the sister sips and releases water from the palm and worships these Deities. She prays to the Deities to protect her brother form untimely death. On this day, sisters do aukshan of Yama in the form of brother and invoke Him. They felicitate Him appropriately and pray to him to restrict the frequencies of Yama moving on Earth and the unsatiated subtle bodies from Pitruloka. The sister does aukshan of brother before the meal. She first applies vermilion mark and unbroken rice grains on his forehead. Then she waves a betel nut and gold ring around his face thrice in semicircular motion. Then she waves an arati thrice in semicircular motion. She felicitates the brother by giving him a gift. While doing aukshan, a spiral of spiritual emotion (Bhav) is generated in the sister. A flow of Chaitanya from the Universe is attracted towards the sister doing aukshan. A spiral of this Chaitanya is generated in the sister. Frequencies of Chaitanya flow from the hands of the sister to the platterand spread in it. Flow of Chaitanya is attracted towards the brother. Spiral of Chaitanya is generated in him. 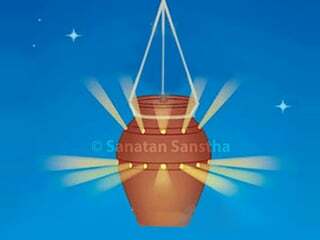 Flow of Divine Energy is attracted in the oil lamp used for aukshan. 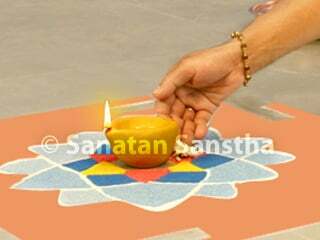 By waving an arati thrice in semicircular motion for aukshan, a spiral of active Energy is generated around the lamp. From this spiral, active frequencies of Energy are emitted towards the brother. The Sun channel of the brother is activated. The brother gains Energy to function and a spiral of Energy is generated in him. Particles of Energy are spread in him. A protective sheath is generated around him. Due to the aukshan by sister, particles of Energy are spread in the environment. Due to the aukshan, the brother is protected from the attacks of negative energies from Hell and the atmosphere. Spiritual emotion (Bhav) is awakened in the brother. From this it is clear, that by doing aukshan of brother by sister, both derive benefit. The distress to family members due to the Yama frequencies is reduced. The family members are protected from the Yama frequencies. The atmosphere of the premise is purified. The environment on Earth remains devoid of agony, that is, blissful for a limited period. After aukshan brother consumes food cooked by his sister. If one does not have a sister, then meal should be consumed at the house of any cousin sister or assuming any known woman as sister. After the meal, the brother felicitates the sister by giving her a gift like clothes, money etc as per his capacity. If the gift is sattvik, it is more appropriate. For example, Holy texts about spiritual practice or Dharma, clothes useful for ritualistic worship of Deities. The gift should not be tamasik. For example, a CD of an inappropriate movie. In some places women first do aukshan of the moon in the evening and only then do aukshan of their brother. In some places, if a woman does not have a brother, she assumes moon as her brother and does his arati. Effects of aukshan of the moon by women on Bhaiyyaduj: Due to invocation of the moon by the woman, frequencies of moon enter the atmosphere. Due to their coolness, frequencies of Yama get pacified and the heat in the environment is reduced. Due to this pleasantness of the environment, there is awakening of the Anahat-chakra of the woman. Brother gaining benefit of Devi Principle awakened in sister: On this day the Devi Principle remains awakened in the woman. The brother gains benefit of this as per his spiritual emotion. If he is doing spiritual practice, then he gains benefit at a spiritual level. If he is not doing spiritual practice, then he gains material benefit. If the brother is doing spiritual practice while looking after business, he gains 50-50 percent benefit at both levels. Due to the prayer by sister, reduction of the give-and-take account between brother and sister: On Yamadwitiya the sister prays for the well-being of her brother. The brother gains benefit of this as per the spiritual emotion of the sister. Hence, the give-and-take account between brother and sister reduces fractionally. Reduction in destiny of sister: On the day Bhaiduj Shiva Principle is awakened in the brother. Due to this the destiny of the sister is reduced by 1 thousandth percent. 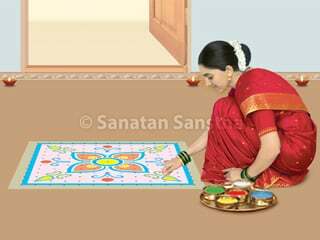 Why is Yamadipadan performed during Diwali ? 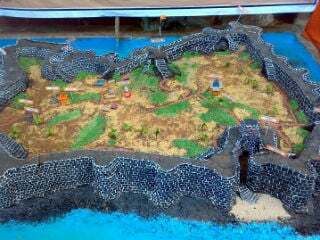 Model forts built during Deepavali awaken ‘Kshatra-vrutti’! Why Govatsa Dwadashi performed before Deepavali? 1. Mark of Divine glory with respect to a Saint or God with all His powers, 2. Shakti (Divine Energy), beauty, virtues etc, 3. Respectful way of addressing a Deity. In Sanskrut, the word Hindu is broken up as hin + du. 'Hin' means to remove and 'du' means darkness. In other words, anyone who makes efforts to remove the darkness of spiritual ignorance (that is, a seeker), is a Hindu. Sustainer in the trinity of Hindu Deities, the other two are Brahmā and Deity Shiva. Sovereign, a respectful way of addressing religious scholars, Saints, kings etc. in Bharat. God, the possessor of the six attributes of strength, fame, knowledge, wealth, beauty and renunciation. A ritual of waving a lit lamp in front of a Deity and Saints, accompanied by singing of hymns. Food offered to the Deity as part of ritualistic worship. A genre of Sanskrut Holy texts and refers to the shāstra or the science pertaining to Hindu Dharma. Ritual of waving a lit lamp in front of a Saint or an individual. Sipping water from the cupped palm thrice, while uttering the first three of the twenty-four names of Srīvishṇu and releasing the water into a plate from the palm while uttering the fourth name.